Oljato has had several trading posts over the years, including this picturesque one near the chapter house, which provided residents a convenient place to purchase necessities until it closed four years ago. Oljato never asked for all this attention. Life went on here long before Hollywood discovered Monument Valley; before their backyard became the Eighth Wonder of the World. They could have done without the 95 uranium mines, thank you very much. If the tourists stopped coming tomorrow (which in fact, they more or less have, at least for the winter), life would go on. The chapter barely noticed the government shutdown. But here they are, host to an endless procession of international tourists and actors and directors and fashion models on photo shoots, brushing the red dust out of gowns that cost more than most people here make in six months. Oljato is the chapter of Monument Valley. "Honestly, we don't pay that much attention," said the chapter's community services coordinator, Shirlee Bedonie. "All these people come and go, and we're still here." It would be a bit naive to suggest Monument Valley Tribal Park is not an integral part of Oljato Chapter. Many families here make their living selling crafts to the tourists or taking them around the park. It was the chapter that spearheaded the building of the welcome center and vendor village along Highway 160 about five years ago. But, says Bedonie, many families still live as they did before the park was established in 1958, just herding their livestock and minding their own business. In fact, the 20 families or so living within the boundaries of the park are more or less forced to live as they did in the 50s. To preserve the landscape, power and water lines are not allowed in the park. "There's kind of a triangle between the families, the chapter and the (Navajo Nation) Parks Department," said Bedonie. "The families come to us saying that they need services, we tell the parks department, and they tell us 'No, we can't do that.'" Outside the park, the chapter is still a maze of jurisdictions. It's bisected by the Utah-Arizona state line, and crossed by three county boundaries -- Apache, Navajo and San Juan. Within San Juan County, Utah, it comprises parts of two voting precincts. "I guess you could say we're lucky," quipped Bedonie. "We have four county commissioners representing us." When Oljato wants to do a project, it involves so much patchworking of funding and convincing people to step across jurisdictions that "it's usually easier to just do it ourselves," Bedonie said. The vendor village and welcome center, for instance, were built with funding from both the Utah and Arizona departments of transportation (although the structures are in Utah), the tribe and the Utah Navajo Trust Fund (fortunately, the project was already on the books before the fund was frozen in 2008 when the state of Utah pulled out as trustee). "ADOT put in the majority of the money," said Bedonie, "so when I hear the Utah people complaining that Utah funds are going to Arizona, I point to this project and say, 'Can't you let a penny roll across the state line?'" This kind of complaint, apparently, surfaces constantly at the chapter meetings. Name: From the Navajo 'Oljéé'to' ("Moonwater"). It is said that a traveler in this area looking for a place to water his horse came upon a beautiful pond reflecting the image of the full moon. Major clans: Bit'ahnii, Tl'izi Lani, To'Dichíinii, Hashk'aa Hadzoho. A reunion for the Bit'ahnii Clan is held here every year by the family of Community Services Coordinator Shirlee Bedonie. Last year it drew 2,000 people. There are also quite a number of people with Paiute blood. Points of interest: Monument Valley Tribal Park, Gouldings Trading Post. About two dozen movies have been filmed among the park's iconic spires, not to mention hundreds of advertisements and magazine covers. A marina was built at Paiute Farms in 1987, but it washed away during a flood. "The Arizona people say, 'Don't give any money to Utah; they have the trust fund,'" Bedonie said. "The Utah people say, 'Don't give any money to them, Arizona is supposed to be taking care of them.' We have to say, 'OK, we know there's a Utah and an Arizona. Now let's move forward.'" At the moment, the complaint is moot since the $40 million Utah Navajo Trust Fund, accumulated from oil and gas revenues in the Aneth area, is just sitting there waiting for Congress to appoint a trustee. Some Utah Navajos want the non-profit Utah Dineh Corp. to manage the trust; others would prefer the tribe or some other entity. Both a Senate and House bill are stalled in Congress, waiting for a unified voice from the Diné. A compromise measure, to simply divide the revenues among the seven Utah chapters, is gaining traction, but President Ben Shelly is insisting the chapters all be certified under the Local Governance Act first. 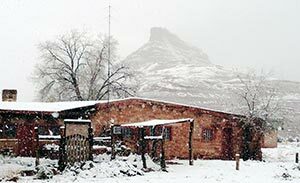 Oljato is on its way to being certified, and could stand to benefit from certification much more than most Navajo chapters: both The View hotel and the lucrative Gouldings Trading Post and tourist empire are located here. Both would generate a generous windfall of sales tax. But Gouldings is planning to sell, and the new owners may decide to scale back, particularly if the tribe takes the private parcel back into trust, as is being contemplated. Nelson Yellowman, a member of the San Juan Board of Education, said the board will be anxiously watching the sale and considering the tax implications on the school district, which only a few years ago built an elementary school in Oljato. While this far northern chapter keeps an eye on this possible land exchange within its boundaries, it's also looking north toward the San Juan River, where U.S. Rep. Rob Bishop (R-Utah) is proposing a gigantic state-federal land swap that could put two million acres into wilderness -- land Yellowman says the Navajos of Oljato use to gather firewood and medicinal plants. While Bishop has brought industry, government and conservation groups together to negotiate the wilderness proposal, Yellowman says he has overlooked the Native Americans who have customary use rights to the state- and federally owned land. "The people in that area are very independent," she said. "They don't ask for much from government. If it's a stormy winter, they just stay home and live off the land. All they ask is that they can cut firewood to keep them warm." Independence is a recurring theme among the proud people of Oljato, but at the same time, they do need some help to take care of things that weren't their doing. Back to those 95 uranium mines. "We lost a lot of people to uranium," said Chapter Vice President Albert Holiday. "Every one of us has lost somebody." While some mine site remediation has occurred, it's only a fraction of what needs to be done, he said. For instance, there's a road in Oljato that was built entirely of mine tailings. "They won't grade it because it stirs up the uranium," he said, "but the school buses are on that road every day. Our children are breathing it in. It makes me mad every time I think about it." 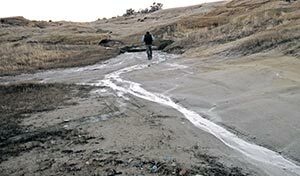 The chapter officials want that road cleaned up, and they're also pressing -- along with Navajo Mountain Chapter -- for a road between the two chapters, which Yellowman said could be started as early as next year. One thing the chapter does not want help with is its feral horse problem. "If we do a roundup," stated Bedonie, "we're not going to ask the Nation to come in. We're going to do it ourselves." This may be the horsiest chapter on the Navajo Nation. Trail rides through the scenic landscape are huge here, drawing hundreds of riders. While most everybody acknowledges there are too many horses on the land, no one wants tribal employees riding around out here rounding them up and carting them off. "The way I see it," said Bedonie, "is those people are paid to round up horses. They come in from the outside. They don't know whose horses are whose, what customary use land they're supposed to be on. They just get them all." Bedonie would rather see the horse owners police themselves, conducting a roundup as volunteers. "Any we catch, we're not going to sell them to someone we don't know or send them to be slaughtered," she vowed. "We'll find someone to take care of them." If the chapter gets certified and the money starts rolling in, one project on the top of Bedonie's list is a horse sanctuary. She already has a name for it: "Equine House." "Equine House will be a place we can take all the skinny, injured horses and bring them back to health," she said. "The young people can come and learn the Navajo way of taking care of horses." If they want to, that is. Out here where the younger generation has been exposed to people from all over the world, there's a major generation gap. Holiday, 69, blames the park. "When I was young, we had stories for every one of those rock formations," he said. "We were told not to go out there, not to disturb them. "Now you have people driving all over the place, the Red Bull (air race), the balloon fiesta. People have forgotten the stories." Perhaps nowhere is the generation gap more evident than in the debate over where to locate the new chapter house the chapter has on the books. The young people, quite reasonably, want it built on the highway, where it's more accessible. The older generation, however, is adamant about keeping it where it is, in an out-of-the-way red rock alcove not far from the pond that gave Oljato ("Moonwater") its name. Holiday remembers when the existing chapter house was built. He was nine years old. "There were no vehicles at the time," he said. "A lot of medicine men came from all over, in wagons and on horseback. They came together and offered prayers for this Oljato. "If we move the chapter house, that prayer's not going to be there. Who is there left who can pray like they did back then?"